Hello all! It's the busiest week of the year at my work, so thinking about places to eat and drink is always a pleasurable divertissement. 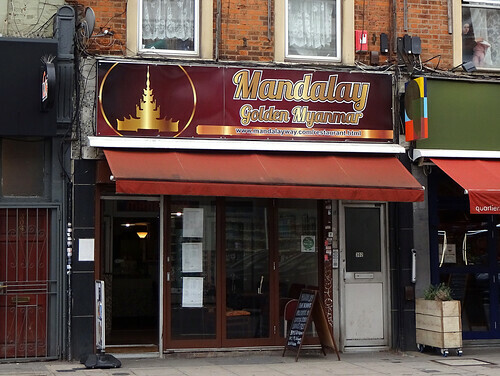 This week's featured article is the extravagantly-named Mandalay Golden Myanmar, NW6 2DB, where you can enjoy all your favourite Burmese food... or is it Myanmarese? I understand there's quite a bit of politics behind the naming of the country, and who would have guessed 10-20 years ago how we'd be thinking about Aung San Suu Kyi nowadays, eh? Ah well, there's still the food, and I'm certainly intrigued to try tea leaf salad, despite some of Kake's adjectives. Two new entries are for The Hercules, which is the bar in the old Pillars of Hercules pub building, and Naughty Piglets, a wine bar ant tapas-y restaurant in Brixton with a twee name. * Babur Indian restaurant in Forest Hill. Finally, there are two reported permanent closures, being The French House, a French cafe in Crystal Palace (not the Soho pub! ), and Mr Lawrence in Brockley, a sad loss to the area, which has been on the decline for some time but had been a fixture there for many decades. 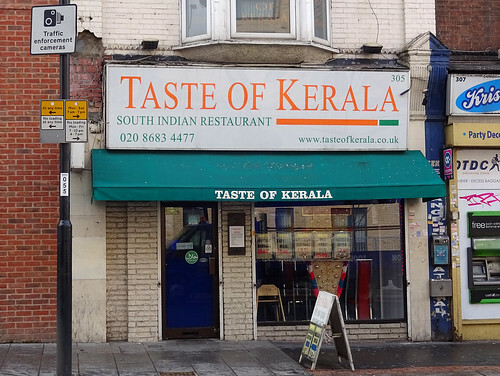 This week's featured article is for Taste of Kerala in Croydon, a small South Indian restaurant which sounds like a handy spot for a lunchtime thali. Good value for money, too! In Latin American cafe news, there's a new page for the Pueblito Paisa Cafe, which is right opposite the 76 bus stop at Seven Sisters station, next to the market. No word on whether they do Christmas empanadas or not. There are updates for The Finsbury pub (in Finsbury Park, not Finsbury EC1) where the lime and soda is FREE, yes FREE, and for the Dilara/Uyghur Restaurant (also in Finsbury Park, not Xinjiang Uyghur Autonomous Territory), where the menu is a mix of Turkish and Chinese dishes. Regular readers will remember the Sir Richard Steele closing for refurbishment back in January - your patience has been rewarded! It's back open and we have no idea what it's like now. Will they have kept the ceiling mural? A world of mystery awaits in Belsize Park. Evening RGLers! 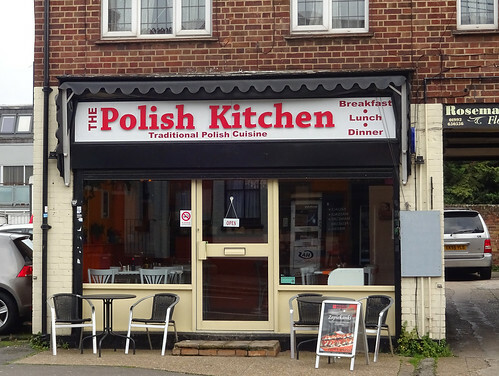 This week's featured article is for Polish Kitchen, a cosy restaurant in Cheshunt where the pierogi made a good impression on our reviewer. The zapiekanki sounds like a popular local choice too. What's happening in sunny Cheam, I hear you ask? Well, our team has been to the Pepper Pot sandwich shop and deli, and there's a new article as a result. Expect their fridges to feature on a German electronica compilation near you soon. Hashtag Cheam! Living room news: the Geffrye Museum on Kingsland Road has shut for a refurb, so your only view of it until 2020 will be from above (on the platform at Hoxton station). The Sir Richard Steele in Belsize Park is also undergoing a redevelopment, while The Oxford opposite Kentish Town station has been sold and has plans for redevelopment too. Lastly, lovers of boshing techno will be sad but not surprised to hear that Elephant & Castle landmark The Coronet has finally closed. Hello! This month's featured article is The George, NW3 2AE, which has been done up by Spirit Pub Co to be the first in a new premium brand. It sure is pretty posh, with blonde wood panelling and light from big open windows at the front and rear. That said, the food is overpriced and my burger was a bit disappointing. Still, there you go. Lots of new additions, the first two in the Kilburn area. From there we have Barraco, a Brazilian restaurant, and The Carlton Tavern, an old man pub on the Maida Vale end. From Greenwich, there's Vietnam Oriental Cuisine, which despite the name is mainly Chinese. Finally, Rose Vegetarian in Kingsbury, which perhaps won't get you rushing out to visit Kingsbury, but if you're in the area, seems as good a bet as any. Significant update to the entry for The Moon Under Water in Hounslow, which despite having been in many Good Beer Guides had remained a mere stub entry in RGL. Possibly because there's not much you can really say about yet another outpost of a Wetherspoons pub of this name. Temporary closure for The Ladywell Tavern to do refurbishments. Reported permanent closures are Elephant Walk, which was a fantastic Sri Lankan place in West Hampstead, and The Red Lion, a pub in Amersham (which by very few relevant criteria can actually be considered to be in London). Finally, the Imperial War Museum has (mostly) reopened. 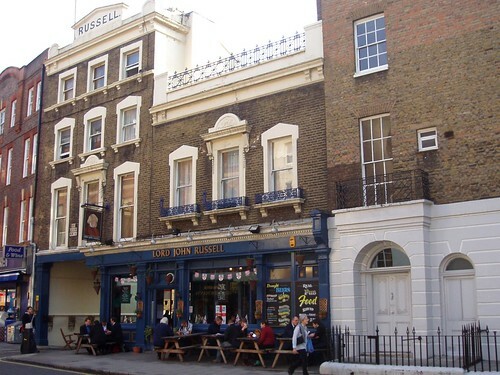 This week's (and next week's) featured article is another excellent little pub, The Lord John Russell, WC1N 1AL, just up the road from the Brunswick Centre in leafy Bloomsbury. It's quite different from last week's, since it's more of a traditional single-room pub mostly focused on a range of cask ales and so many taps along the bar that you can barely see the staff behind them. We have one new article: Muncho, a cafe and sandwich shop in Croydon with chewy bread and Turkish breakfast. 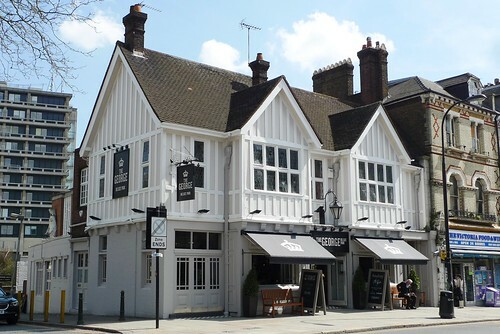 There's a significant update to The George in Belsize Park, which has rebranded as a 'premium' Spirit Pub Co pub, completely with blond wood furnishings and "craft beer" on the taps. It's okay. Also, happily, a reopened and renamed pub! The Chandos Arms replaces the old New Chandos near Colindale tube station. As implied above, the next update will be in two weeks' time. 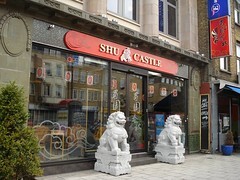 This week's featured article is Shu Castle, SE1 5TY, a Sichuan restaurant on the Walworth edge of the Old Kent Road. New additions are: The Oracle's Juice Bar, a vegan cafe in Brixton Market; and two pubs in Penge, one upmarket (The Bridge House) and the other aimed more at locals (Hollywood East). Updated entries are Nincomsoup, a soup-based cafe by Old Street; The Angel, a nearby pub; and The George, a pub in Belsize Park. Reported closures are: La Grolla, an Italian in Upminster; The King's Arms, a fine pub near Chancery Lane, now a gastropub called The Lady Ottoline; The Sun and Doves, another excellent pub, in Camberwell; and Ruby Grand, a bar in Hammersmith (but also replaced by another pub).